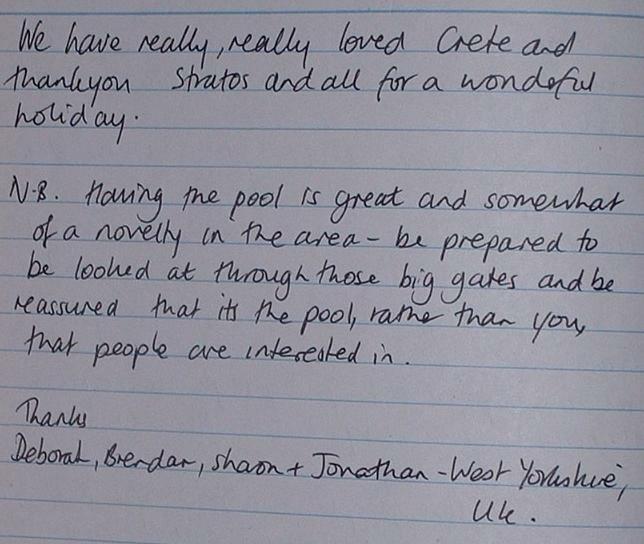 Ever since we open our doors for holidaymakers, our guests have contributed with generous comments. We strive to provide the best possible service and the comments we receive are gratifying.We are proud to share several Villa Christiana comments and reviews of the many satisfied customers that we have hosted. Upon your holiday completion we hope that you will feel the same way and reflect back on your experience at our Villa Christiana. Thank you for taking the time to read these kind but useful comments. we have the greatest guests and they come from all over the world. They visti from Great Britain, Canada, United States, Greece, Germany,Findland and the list goes on. I am back at work and needing another holiday!!! Just a few words to thank you facilitating such a lovely, holiday, we had a great time. 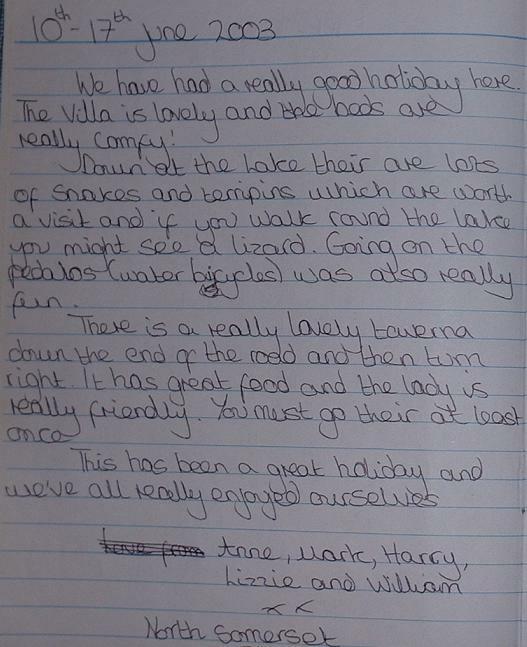 I have put my comments in your visitors book but the work that you have done within the farmhouse really is a credit to you and we all had a lovely time. My mother and father are in their early 70s and a couple of years a go my mother was taken very poorly, she states that sitting on the lake and staying in such a lovely abode resulted in one of her best holidays ever!! High praise indeed Stratos. I’m thinking of bringing them out again in February for a week dependant on costs and wondered if you could give me details of costs; rental, flight costs and perhaps hire car. The timing of the week in February really does not matter we are very flexible. George and his family were fantastic also. They gave great advice and their restaurant was great. 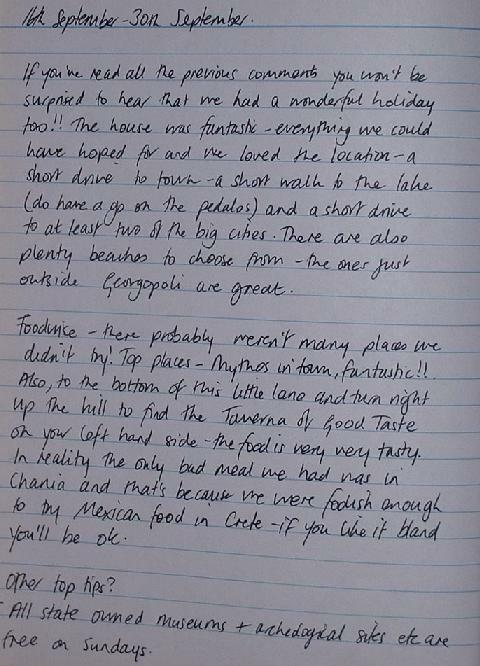 Dear Martin and family, we were delighted to have your wonderful family stay at our place. We are looking forward to see you soon. This is a belated note to say thank you for the holiday arrangements. We had a great time and we delighted with the accommodation. Everything was as you had promised and the villas very much ‘home from home’. Athena was most hospitable and helpful. If you get any enquirers who are looking for confirmation from a previous guest that the arrangements work smoothly, please do not hesitate to refer them to me. We are planning to buy and build in Crete ourselves, so may need short-term accommodation (probably not for all of us) sometime in the next year or so. I will check availability with you nearer the time. We are very satisfied with living in this property. The house is big , full of air and very nice. Being traditional Greek home (18-th century! )it has stone walls,high ceiling,a lot of space and cool air. All the windows are equipped with mosquito nets. Two bathrooms, good kitchen and cosy bedrooms allow to have all the necessary comfort. The house is situated in the village, in 200 meters from a big lake,in a very quit environment. At the same time there are only 4 km to the sea beach! Stratos was great, all our needs he arranged immediately and he took care of the pool. He was always nearby but not bothering us. We will definitely recommend this property to our friends!